Between late March and early April, there is a traditional Qingming Festival in China. Family members get together on this day and visit their ancestors’ and passed love ones’ graves. They are there to tidy up graves and show their respect and love. It is a day of remembering and sharing. Usually food is also an essential part of this ritual. What food items to bring really depend on local traditions and family preferences. Besides chicken, duck, and pork, there is one item most people bring and love: green sweet rice cakes. The green color is from fresh young mugwort plants. It is popular because of good herbal grassy flavors as well as medical purpose to refresh up both body and mind. As time goes by, people like these green sweet rice cakes more and more that they are no longer just a food item used in Qingming Festival ritual. They become a daily snack / dim sum. I tried many times. It is just very hard to get hold of fresh young mugwort plants in United States. So I substitute with spinach puree and matcha green tea powder. Spinach puree brings the dark green color and matcha green tea powder adds a mild herbal, earthy and grassy scent and flavor. With a spoon, scoop egg yolks out salted duck eggs. And then crush them with the back of spoon. Mix with shredded pork and syrup. Combine roasted black sesame seeds, peanuts and brown sugar in a coffee grinder. Do this in two or three batches to get even and smooth grind each time. Soak and clean 6 to 8 dry bamboo leaves, which are sold in most Asian grocery stores too. Lightly grease them with vegetable oil. 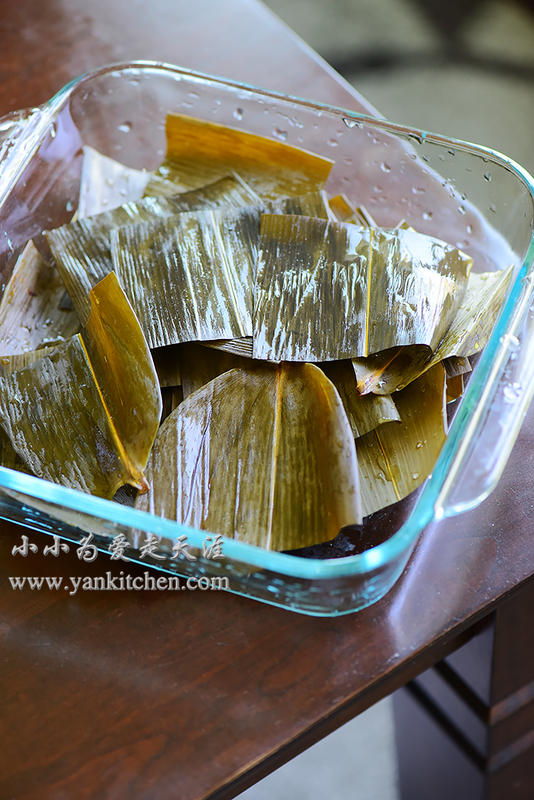 If you don’t have bamboo leaves available, substitute with parchment paper. Blanch the spinach; add to vitamix along with some water; puree on high speed until very smooth. Add sweet rice flour, matcha green tea powder, vegetable oil and sugar. Combine everything together and knead into a ball of green sweet rice dough. Divide the dough into equal-sized small pieces. Press down and thin out with palms. Add salted duck egg yolks and shredded pork filling. dd black sesame and peanut filling. Wrap up and gently round them up between palms. The ones topped with black sesame seeds mark sesame and peanut fillings. Transfer sweet rice cakes in a bamboo steamer lined with greased bamboo leaves, one inch apart from each other. Remove from heat and allow the sweet rice cake balls to cool down a little bit. Both fillings are very tasty.